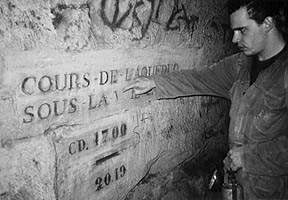 An unguided public tour of the Parisian catacombs. The imagery is great - walls of stacked bones and skulls in arty, symmetric patterns. It's also a good contrast to the real catacombs, as I later learn. Most non-French tourists, however, have no idea what's going on here. A long time, you who cannot / count on a single day." When we emerge in an alley blocks away from where we started, it's hot, blindingly bright and I feel just a tad dirty and mischievous. A taste of things to come? I'm here in Paris to find out why people go underground. Seems like a totally irrational thing to do. I mean, we all end up there -- six feet under. Why rush the process? Emmanuel Gabily is taking me underground. My wife thinks he looks like a young Yves Montand. I think he's dangerous, well potentially dangerous to me at least. We've met over the Internet and are now sitting face to face at a web bar in an industrial district of Paris. Emmanuel is worried about my rubber boots. He doesn't think they're high enough. That's not a good sign. I don't want to drown. Emmanuel is not alone. His cohort in crime Benito (Benjamin Nitot) apologizes for the limp handshake. A motorcycle accident. He's hoping he'll get some feeling back into his right hand real soon now. And he's excited because, like Emmanuel, he thrives on initiating neophytes. Seems he's conned a young couple who parked next to them to forgo the cinema tonight. As we thunder along in Emmanuel's sagging Peugeot the Paris cityscape disappears behind us. We are heading into la Banlieue. Emmanuel has a few caves he wants to show us. The first one is made of chalk. I don't have a great feeling about this. We're joined by three more male cataphiles whose English is as bad as my French. As the pros switch into their coveralls and miner's helmets in the suburban parking lot, I wonder where the police are. I wait til the last moment before strapping on my Mountain Co-op spelo headlamp. I tell them it's my geeklight. They nod politely and for the rest of the evening I occasionally hear them discussing it with great seriousness. The entranceway is a blocked off fissure of rock in the distant woods. Fortunately there's a ladder - it's a 20-foot drop. I am immediately struck by the beauty of it all. The vaulted ceilings are breathtaking. We can walk five abreast. No claustrophobia here. These are more caverns than tunnels. I could get to like this. Emmanuel suddenly lets out a scream - something he is prone to do quite erratically while underground. There is no echo. The chalk walls absorb everything. The others join in with hoots and hollers as we trudge along. Our host leads us through the maze of turns and dead ends never needing a map. It seems gridlike but I could never find my way back. Now and then he directs his lamp at points of danger - sudden fissures, bottomless pits - no guide rails here. There is abandoned machinery clearly decades old. And signs of previous visitation - plastic water bottles, cookie tins, discarded batteries. The movie goers are just proclaiming their good fortune when we arrive at a dead end. A rickety ladder leads upwards along the crumbling wall to a rabbit hole in the ceiling and, Emmanuel promises, an upper level. We squeeze through one at a time. We of the aboveground follow the roads, wait at the stoplights, and live in one plane. But down here ... well, it's three-dimensional. There's above and below and further below and ... as far as you can go. But now I see the reason for coming here. Not far away there's a balcony - an open view of the line of tunnels below. And it's a place to make camp. We sit back and rest. 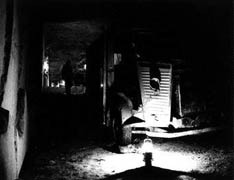 Slowly, without instruction, everyone turns off his or her lamp or flashlight and it goes dark - totally black. And silent. Not a sound. No dripping. Nothing. N-O-T-H-I-N-G!! I have never experienced anything like it. You don't have to close your eyes. You don't have to tune anything out. One man's tomb is another man's refuge. I don't know how long we stay like that. Finally Emmanuel asks me to turn on my flashlight so he can fire up his lamp. He grabs his knapsack and heads off. The others start a fire with liquid propane and open tins of chili and canard confit. We converse quietly, in French and English. Below Emmanuel is planting and lighting a candle at each tunnel intersection. There are easily twenty disappearing away in a line as far as the eye can see. Another magical moment. I think of Robert Smithston. Earthworks - 30 years later - this time under the earth. When Emmanuel returns I feel stupid even asking. Why do you do it? "To wash my brain," he ventures, followed by a self-depreciating laugh. I think he knows the English is a bit off. "It's another world, but it's our world. There is a culture. No one can touch us here." He pulls out a flyer, hands it to me. He's planning his birthday underground. Friends, music, champagne. I can't think of a better place. Miles later we hop a fence and walk down into an underground limestone quarry. Someone was growing mushrooms and storing potatoes here. They've all shrunken into an organic mess. And there's an abandoned Citröen truck. The boys have stripped mementos and built a clubhouse in the far corner. It's named after the truck license number. There are steps, a dais, seats even a table made from one of the abandoned giant circular saw blades. Someone else has carved sculptures in the wall. We're all tired. It must be five or six in the morning. Time for more cooking, hash and the last of the wine. We barrel through the deserted Paris streets, as dawn breaks onto the city skyline. Benito snores in the back seat immune to the irritating technobeat. At least it keeps Emmanuel awake. He casually mentions a German WWII bunker under a high school near the Luxembourg Gardens. I want to know how soon we can go. Friday night I take the Metro the farthest south to Port D'Orléans then walk, a bit lost. It's off my map. Emmanuel and two new pals are waiting for me at a dark suburban street corner. Kinda looks like that shot out of the Exorcist. Hmmm. Stephane, mid-30s, and Jean Baptiste, mid-20s, are eager to practice their English and politely check me out. Yes I'm ready to book off eight or nine hours. Yes I can keep up. All of a sudden the previous night looks like a test for something ... big, something serious. Those were caves. These are tunnels. There's a difference. And, once again, the ritual. Changing into boots and coveralls on the dark side street. A local walks past with his dog, ignores us. But three younger guys lock a bike to a pole and nod. They head off into a small vacant lot. We follow minutes later. Amidst the garbage Emmanuel pulls a junked foam chair from a brick wall and there it is -- our entrance. Our rabbit hole. This time cut out of rough cement. The others lead the way. It's tight -- real tight -- a bit of a twist, then a fall ... into darkness. I hit solid ground and move out of the way. I don't hurt myself, or anyone else. A good start. To the left there's a bricked-in room, a kind of way station. The three younger guys emerge, not surprised to see us. Emmanuel quizzes them. No they don't have a map. They're not going far. Then they head out. Hash dealers, he informs me as we enter the room. They'd better not go too far. They'll get lost. Our waiting room is an odd shade of ... pink. Stephane is the culprit. He got a discount on some end of line paint. He smiles and takes great pains to assure me he isn't a graffiti artist. In fact he whitewashed one of the aboveground walls. Someone had betrayed the tunnel entrance. The few left, like this one, are hidden in the suburbs. They quietly finish their cigarettes in silence. Then it's time to leave. It's a march, a forced march. We have a long way to go. We're following the railway above. To our right on the tunnel wall there are metal supports holding cables. One slip or miscalculation and you get impaled in the right side. And these guys really move. It doesn't take long for me to see the real problem. You have to keep up with the person in front of you. The afterglow of his light illuminates your way. And in our next tunnel the ceiling is irregular and much lower. We're crouching, walking ape-like. I try and keep in my predecessor's footsteps, almost like walking in snow. 'Cause we're hitting water - about two feet deep. And I don't want to break an ankle. So it's feet splayed at the far edges of the tunnel floor. I'm trying to regulate my breathing and not fall in. This is a lot harder than I'd imagined. Once we're out of water the ceiling drops considerably then I realize my first faux pas. Jean Baptiste is shorter than I am. So when he ducks, I should duck more. But I learn this the hard way and I let Emmanuel pass so I can take up the rear. I don't want him to see me rubbing the bump on the top of my head. A good 20 minutes in, it all becomes an incredible maze. There are a lot of tunnels, a lot of choices. If I separate or lag, I'll never, never find my way back. I could be left wandering around down here forever. Fortunately my guides know where they're going. I just have to keep up. But it's hard. 'Cause there's so much to see and they're into stopping for the strangest things. Like pointing out and commenting on the most arcane architectural detail. As with any band of esthetes it pays to tune in and follow the conversation. The cornerstones with the street names and dates intrigue me. They're beautiful and vary wildly from 1777 to 1890. 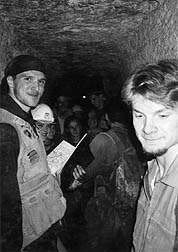 But my guides are into the varied tunnel construction. And they point out graffiti from revolutionary times -- 1789 and 1968. This is too weird! And this is certainly not New York City. There are no homeless here. It's too much of a trek and the police have sealed all entrances inside the city. Algerian terrorism is their latest fear. No, this is a time warp -- unlike anything I've ever seen before. At every corner I expect to run into... well, there's no one else down here right? I hear something -- music? I ask the others to stop. Silence. They doubt me. I double back a few steps to a dark tunnel entrance angling off from our direction. Now they too can hear it, music, getting closer. Emmanuel pushes past me lets out his infamous screech! We listen. No reply. But there's a light approaching and distant voices. Emmanuel looks at me. "Is it English?" Before I can reply he curses "Tourists." And sure enough, eight boisterous, Gen-Xers arrive -- four guys, four gals. Their smiling bandannaed leader extinguishes the technopop and greets us in broken English. "Have you seen the police?" Nope. "They're chased us at La Plage." Emmanuel seems dubious. These neophytes are proud they've come all the way from Germany. Emmanuel points to me, and counters "Well, he's from Canada." The leader calls Emmanuel "brother." He doesn't like that and he remains pretty cool to them. They sense it and confidently head off. I've peeked at their leader's map. It's old and limited. Emmanuel spits it out again: "Tourists!" He makes sure they are not following us. 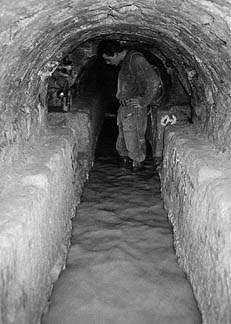 Often side tunnels are blocked off. Sometimes it's the police; sometimes it's development. The pattern of blocks in this one reminds me of "Man in an Iron Mask." But Jean Baptiste is more blasé -- "probably a parking garage." As we walk Emmanuel has this odd habit of reaching up and touching holes and little grottos which have been cut above head height in some of the older tunnels. I guess there were once candles or religious statues kept there but personally I'd keep my hands to myself. I can't think of the French word for "mousetrap." Finally he stops and brings down a folded piece of paper. It's a pretty zany tract about extreme spelo/cataphiles. I don't pretend to understand. But it's a couple of years old, faded and damp. Emmanuel saves it for his stash at home. He has hundreds of drawings, statements, fanzines left by fellow travelers. He leaves his birthday invitation in its stead. My watch is safely hidden in my pocket protecting it from underground scuffs but I really have no interest in knowing the time. We're going back in time but not in any logical order. Jean Baptiste points out a mini bas relief of a castle cut into the side of the limestone wall. He doesn't remember it from previous visits but he isn't sure. There are hundreds of kilometers of tunnels here. We're in an underground museum but the displays are out of chronology, 1850, 1777, 1941, and now I spy some fluorescent graffiti - last year, last week, and yesterday? After a long stretch Stephane points out a hole in the tunnel wall. "Bunker -- later." I'm glad I've lost weight -- it's a male 34" waist maximum. Fortunately these guys are pacing themselves. It's rest time. 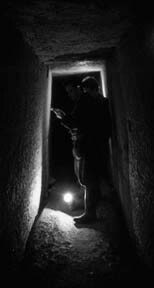 We enter a small room-like cavern. 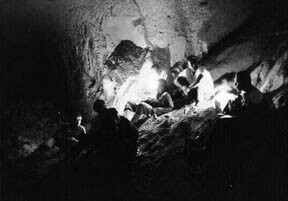 Once we've lit it with candles and lamps my guides embark on a most curious exercise - pounding spikes into the walls and support pillars of this small cave. This seems pretty dangerous to me. This place is dug out of questionable rock and the pillars are really just stones stacked on one other. And, with every whack, parts of the ceiling seem to disintegrate and fall down onto us. I retreat to the entrance ready to dive out into the safety of the tunnel. What pray tell are these guys up to? Stephane is the first to succeed and stretches some netting between his two secure connectors. He carefully eases into his hammock, smiles as the others continue and fail miserably. Then one of his spikes suddenly flies out of the wall and he hits the cold hard cave floor. We all laugh. I am under Paris with the three French stooges. For dinner, they warm tins of duck confit and break out the bread and wine. I offer water and Power Bars. They eye the latter curiously. Jean Baptiste: "Hashish?" I suggest saving them for dessert. And they are Frenchmen. As adamant as they were about pushing on, they savour their dinner and rest time. Stephane is a curious fellow. He has spent over four years amalgamating existing technical maps (I don't ask why or how he obtained them) with his own underground explorations. Whenever we find something new, or something old that is blocked off, he dutifully annotates a working copy of his master that he carries in a binder with plastic sleeves. The whole map is a giant Photoshop file that he has printed in Switzerland. While it's black and white, it shows over six levels. Stephane dreams of producing a colour-coded version. Why does he do it? Because no one else has. Because it's there. And what about his family? He's already taken his two pre-schoolers into a cave in the provinces. They loved it. Emmanuel tells us of encountering a rather odd couple with a 10-year-old child in the tunnels last year. I ask how often they meet people down here. Sometimes no one, sometimes once or twice a journey. It depends. None of them have encountered the dreaded tunnel police. There's supposedly a 600-franc fine. Emmanuel is skeptical of the German tourists' purported chase. He figures a couple of drug dealers were just having fun. I ask if it ever really gets crazy. Emmanuel has seen a fire breather practice his craft here and on one of the few times he traveled on his own he heard some reggae music and saw an approaching light. An odd man, "Le Catacycliste", pedaled up on a bicycle, talked for a bit then waved and continued on his way. I don't know whether to believe him or not. The others nod seriously. Jean Baptiste is a quieter type; younger than Stephane, less obsessed. But there's a suggestion he's been further afar, has taken more risks. He confides he has a freedom down here that doesn't exist above ground. And I have a feeling he's a different man down here. As before, there's a point when the talk stops and the lights go out... On camping trips you sit back and listen to the wind in the trees or the distant loons. Here you take in the jet-black silence. And again, I don't know how long we sit there. It's pretty clear how you get in there, but it's also pretty comical: headfirst with your partner pushing your legs through. Again there's a different tunnel architecture. We're supposedly underneath a high school. It's more brick-like. I guess the kids never make it this far downstairs. But the Germans did. Most of the Nazi vestiges are gone now from the bunker but there are still warnings like "RAUCHEN VERBOTEN", and sealable metal doors that look like they belong on a U2 submarine. And there are a lot of rooms -- small rooms. God what were they used for? One has a lot of wall mounted electrical conduit boxes - makes me think this was a communications bunker. I don't know why. And then another room where, as my eyes adjust to the darkness, I can make out some kind of metal bench frame. The wooden slats have disintegrated and dissolved into the stone floor. Eerie to say the least. We're all kind of quiet here. Everybody investigates on his own. And when we finish at the far end, I expect to turn around and retrace our steps. Stephane is pointing to a fissure in the wall. This one I'm sure I can't fit in but he's already on his way. The others look to see if I will follow. I briefly consider seeking a new occupation then throw my pack ahead of me and clamber in. It's a sideways crawl up and then down. I have about eight inches clearance on either side. 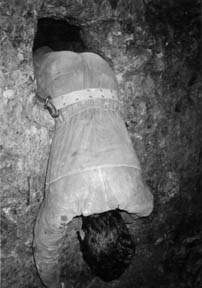 This is the closest to being buried alive that I have ever experienced or ever... wish to. And there's no end in sight. The slightest cave in and we will all be crushed. No one will hear us. No one will find us. Why am I doing this? I don't have time to answer. There's a guy behind me and I have to keep up. I figure we crawl 60 or 70 feet before emerging. I can taste the dirt. My ribs are killing me. But when we emerge we all smile and laugh. That stupid smile men use when they've done something male together. We're back in the tunnels. I guess it was just another way out but clearly one they wanted me to experience. I hurry to catch up as my three friends head to the nearest intersection. There are no street markers. Stephane is studying his map. Jean Baptiste grabs it, turns it 180 degrees - the international sign of spatial disagreement. They argue. I don't need any translation. I know none of them carries a compass. Clearly we are lost. Most men would panic. These three are overjoyed. Uncharted territory! Stephane smiles at me. By taking me down they have been rewarded. I've brought good luck. Now I wonder if they'd ever been through that last crawl we just took? I think my knees are shaking. We are true explorers now. At each intersection Stephane draws a series of lines on his map. He seems to pace things out but I'm too weirded out to ask. And these tunnels are looking... well different. They're not smooth. They're tight and there are signs of cave-ins. Every now and then there are little offshoots that go for 20 or 30 feet before coming to a dead end. Emmanuel has me take his picture crouched at the end of one. He lets out a squeal of glee and beckons to me. As I approach I realize he is suspended over a pool of water. Totally clear water. No one has been here he tells me. Not for a very long time. As our mapmakers continue I look to Emmanuel for guidance. These are test tunnels he tells me. For checking the foundations of nearby buildings and the consistency of the earth. So...? So they probably found it was too dangerous to build here. Great. Stephane is so proud of his newfound mapping ground. With the gas flame on his baseball cap and his funny pointed nose I am prone to liken him to a mole. I must be getting tired. His grin is getting to me. Even these guys have their limits. Aboveground duties and the wrath of angry wives beckon. But Emmanuel is honorable to a fault. He asks me if I still want to see the real catacombs? I don't even flinch. "Mais bien sûr," I reply in imperfect French. The others smile, proud of me. But they're heading home. There aren't a lot of rest stops so when this one presents itself we sit down. In the middle of the room there is a miniature stairway, a sculpture. Something to do with the 15 kinds of stone in this area. Well, maybe it's a bit scrambled in the translation. Stephane and Jean Baptiste concentrate on providing Emmanuel with adequate sections of map to facilitate our safe return. I hear that music again. But before I can react, there they are -- our eight German tourists merrily continuing on their way. They join us and elect Emmanuel to take their photo. He agrees gruffly as they pose en group. Then, once again, they're gone as quickly as they appeared. I bid adieu to my fellow cataphiles Stephane and Jean Baptiste. We watch their light disappear down the tunnel wall. I reconsider the concept of safety in numbers. We zig zag for a while then follow some ancient stone stairs down to another level. The real catacombs are not as neat as the tourist version. No artful crosses made from rows of skulls here. Bones are strewn about. Then Emmanuel shows me the side galleries. Bones piled three or four feet high - in tunnels that go... well, forever into darkness. There's a discarded pair of latex gloves at the entrance. Emmanuel is quiet. This is where the crazies come he tells me. I'm afraid to ask. Seems some types get off on throwing themselves onto the piles. Surfing the mosh pit of humanity. Now I really am glad I didn't ask. So much to see, so little time. But we're heading home. Maybe an hour and half if we really move. But Emmanuel is nervous. He wants to avoid La Plage. The Germans claimed the police were on the prowl. We're not going to take any risks. So we're going to detour. My guide is finally happy to be in control. And at first the two of us really make time. But even I can tell we are retracing our steps. Several times Emmanuel checks his map. Then suddenly two young guys - early twenties, pass. And do I mean pass. These are men on a mission. A simple "Salut" then they're gone. Emmanuel shows little interest in following them. I figure the less I know the better. We continue on our way, but we are lost for quite a while. Finally he consults the map one more time, then assures me we're only half an hour away. When we hit the water it all comes back. This time I slip. A soaker. We rush. I'm tired, anxious. I get cocky and hit my head -- real hard. Emmanuel turns. He heard it. I can feel the blood but I nod and we continue on. I steady myself with my hand on the tunnel wall and avoid the dangerous metal supports. Three strikes and you're out. We slither out into the pre-dawn sky. It could've been noon for all I know. The metro is just starting up. Emmanuel drops me off. Sad to say "Goodbye" to my guide, my fellow adventurer but we're both tired. And he's a man of few words. We smile, nod. "A la prochaine." "Later." His Peugeot darts into the early morning rush hour traffic. Emmanuel drives aboveground just like he travels below. A few honks and squeals, then he's gone from sight. I am on one of the first trains north. My hair is a mess; I've covered in dirt. It's a wonder they don't arrest me. But no one is taking notice. I've just spent ten hours under Paris with a bunch of crazy cataphiles, drug dealers and extreme tourists. In front of me now, early morning commuters. I know I've surfaced but as the subway train accelerates I remember where we really are. It's just a different crowd and we're still underground. 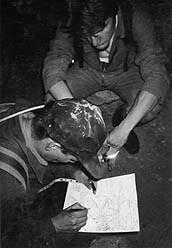 This article originally appeared in Infiltration 9 (June 1998), together with articles on Italian subway tunnels and Glasgow's underground railways. Murray Battle is a filmmaker. He's researching a project on people who spend time underground (legally and illegally). The full, paper version of Infiltration can be ordered for $2 cash (US or Cnd) from Infiltration, PO Box 13, Station E, Toronto, Ontario, M6H 4E1, Canada. Please toss any comments, queries or contributions to Ninjalicious.